The Polaroid Automatic 100 Land Camera is the first model in the 100-400 series of folding rangefinder cameras. The Automatic 100 was produced between 1963-1966, and was the first Polaroid camera to use pack film. Polaroid is often hailed as one of the leaders in photographic innovation for the introduction of the Automatic 100 and its "new" type of film in the form of a flat drop-in pack. The photographs also developed outside of the camera, which allowed for a faster succession of exposures than previously experienced. The faster exposure time coupled with the simplified film loading process made the Automatic 100 a consumer favorite. The Automatic 100 is also notable because it was the first mass produced camera to have an electronic shutter. The camera features a hinged viewfinder and a folding bellows that collapses for compact storage when not in use. The viewfinder has separate windows for composing and focusing the image. It also has automatic exposure and a 3 element glass 114mm f8.8 lens. The Polaroid Automatic 100 uses a 532 3V battery, and 100 series pack film (FujiFilm's FP-100C is readily available today). 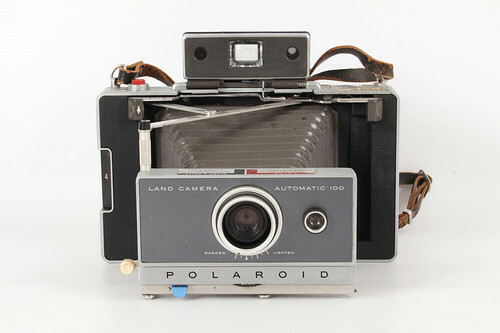 A great "first in series" camera for the vintage collector! Click HERE to view the Polaroid Automatic 100 Land Camera on the KEH Camera Outlet on eBay.